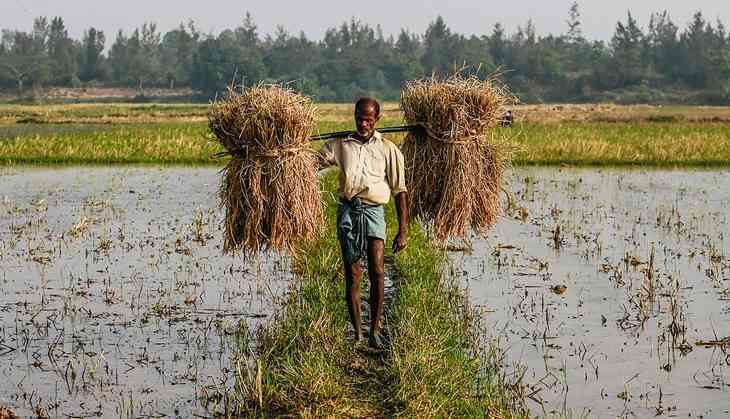 Home » india news » Farmer distress up despite record production. Why, and who is to blame? Farmer distress up despite record production. Why, and who is to blame? The recent Mandsaur incident has put the spotlight firmly on the continuing farm distress across the country. The town in western Madhya Pradesh came into the news for all the wrong reasons, as a farmers' protest turned violent, leading to the death of six farmers in police firing. The demands of farmers from Mandsaur and its adjoining districts were simple: they included a higher support price for their produce, and a loan waiver, largely because a good monsoon led to bumper crops, which resulted in a crash in prices. Farmers were not able to recover the input cost, and overwhelmed by panic, selling their peoduce at half the price than what they received last year. Soon, they were out on the streets seeking government assistance. That is when the violence and deaths occurred. Clearly on the back foot, the Shivraj Singh Chouhan government acceded to the farmers' demands and announced minimum support prices for a variety of crops, including pulses and onions. The CM also sat on a two-day fast, pleading with farmers from the Malwa region to give up their protest. The slew of announcements made by the government finally saw farmers giving up their protest, with peace returning to the troubled districts. However, many believe this calm to be temporary, as these measures do not address the real issue – rural distress. Despite witnessing record food production in 2016, which saw farm growth crossing the 4% mark, the country witnessed protests in several states, with farmers demanding better support price for their crops, and loan waivers. This is ironic, since farmers should be celebrating rather than protesting over the phenomenal growth in production. But the real issue lies somewhere else. Economists believe that the distress in the rural economy is the real cause, while the rest are only symptoms. Though economists are divided over the reasons that led to violent protests in Mandsaur, they unanimously agree that the rural economy is in tatters, which is beginning to reflect in several such protests and movements slowly gaining ground in the agrarian community across the country. Similar protests are being witnessed in Punjab, Haryana, Maharashtra, Madhya Pradesh, Tamil Nadu and other parts of the country. A leading economist from Punjab associated this distress with the over-dependence on cash crops or horticulture crops that are vulnerable to price risks. “Foodgrains like rice and wheat enjoy government support in the form of MSP. However, horticulture and cash crops do not have any such support, which was the leading cause for the protests in Madhya Pradesh,” he said. According to the economist, agriculture in the states is increasingly getting commercialised, and the higher returns from horticulture and cash crops led to farmers growing them. “Farmers were enticed by the higher returns associated with these crops, while ignoring the risks involved. One must remember that most of the farmer suicides were associated with cash and horticulture crops,” he added. In fact, horticulture crop production surpassed foodgrain production for the fifth straight year. It is for this reason that the economist from Punjab claimed that MSP for such crops is a must if the government has to regain the farmers' confidence. “Regular commercial farming is not viable without MSP. In fact, agriculture in western countries would collapse if the governments didn't offer support to farmers,” he said. Meanwhile, economist and India's former chief statistician, Pronab Sen, is of the opinion that farmers are justified in protesting against government policies which have pushed them to the wall. He argues that the shift towards horticulture was part of government policy, and farmers shouldn't be blamed for it. “It is very difficult to bring horticulture under MSP, as most of these products are perishable. The government should instead focus on increasing the country's storage capacity. India's storage policy largely revolves around cereals, and any increase in storage capacity could mitigate the crisis to a certain point,” he says. However, Himanshu, Associate Professor at Jawaharlal Nehru University's Centre for Economic Studies and Planning, does not think that horticulture or cash crops are the real cause for such distress. Instead, he blames the policies and priorities of the Modi government as the sole culprit for the farm distress. “It has been going on for quite some time, and it was the killing of farmers in MP that got everybody's attention. Prices have been collapsing, public investment in agriculture has been on a slide since 2011-12, and worsened after the BJP government came to power. Input prices have been going up since 2014 and during this period, the collapse in prices of farm output has been phenomenal, leading to farmers protesting against their shrinking incomes,” Himanshu says. He goes on to add how the input costs – labour, electricity, diesel, seeds, fertilisers, pesticides, among others – have only increased in the last few years, while the income from the sale of these crops has crashed. Moreover, the severe job crunch in rural areas has further added to distress in rural economy. According to Himanshu, in the past, non-farming avenues like construction and manufacturing would absorb a large chunk of the workforce and provide a cushion to farmers. “But that is all now gone under the NDA government. In fact, 50% of farmers' income came from sectors like these. Even MGNREGA provided some relief to debt stricken farmers, but that doesn't have the support of the government,” he says. He also believes that the farm sector now has the additional responsibility of providing employment to all those who have lost their jobs in other sectors, which will further worsen the situation in rural parts of the country. Moreover, negative food price inflation has also led to severe demand depreciation and Himanshu points how the ministry of labour has accepted that the country has lost 15 million jobs in the last 15 months. Dr Abhijit Sen, former member of the now-defunct Planning Commission, highlights how horticulture and livestock trade have been the fastest growing components of the rural economy. He believes that just like horticulture crops, livestock too is perishable, and blames the government's recent policies and “stupid” gau rakshaks for adding to the misery of the farmers. “Milk and meat consumption have been increasing at a phenomenal pace, which provided some relief to the farmers in case they didn't get the return they expected from their crops. Milk is better managed through cooperatives in some parts of the country, while meat sales have come down drastically because of stupid gau rakshaks lynching people on mere suspicion. The economics of the rural sector depended on the price a cow would fetch once it stopped milking. This is hurting the farmers and will add to their woes in days to come,” he says. Food policy expert Devinder Sharma claims the accumulation of distress over the years has led to farmers taking to the streets. In his opinion, agriculture has been decimated over the years because of government policies, wherein prices have been kept low to curb inflation. “Agriculture had to be sacrificed for economic growth and the cumulative impact of all this forced farmers to protest,” Sharma says. Chandigarh-based Sharma claims that there was visible distress for the past few years, and no one knew what will trigger protests. Speaking about the protests in Maharashtra and MP, he says it is a very spontaneous movement of farmers, which was triggered from a small village in Maharashtra, wherein the gram sabha passed a resolution to go on strike and cut off supplies to adjoining cities. According to him, the loan waiver is the tip of the iceberg, which will see farmers from other states making similar demands. Like others, he, too, blames the government for having no seriousness in addressing this issue. Most of the economists Catch spoke to believe that while the distress in the rural areas has been simmering for the past few years, demonetisation was the last nail in the coffin. They pointed out how the flow of money that kept mandis alive was sucked out, which severely impacted the farmers dependent on daily payments to make ends meet. “We were not getting the right prices for our produce, and then demonetisation happened. Its impact was so severe that most of the farmers were not getting paid for days, and this aggravated the farmers who were already under such distress. Left with no option, we decided to hit the streets forcing the government to pay attention to our sufferings. And it worked,” says Yogendra Joshi, a Mandsaur-based farmer leader.